Located on the lively Fremont Street Experience pedestrian promenade, The D Las Vegas represents the fresh energy and fun associated with downtown Las Vegas. Featuring 629 remodelled modern rooms and a unique two-level casino, this hotel offers its guests the option of indulgent gambling and comfortable stay under one roof. The two floor sleek casino housed in the hotel boasts of high-octane gambling on the first floor with pretty dancing dealers, and the ‘Vintage Vegas’ experience is rekindled on second floor with a Sigma Derby simulated horse race, coin-operated slots and other exciting games. LONGBAR—the longest bar in Nevada state, where talented bartenders, in a magical display of their craft send bottles and glasses flying through the air. 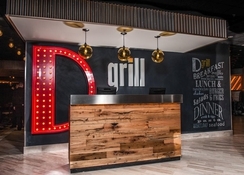 The D-grill is to try out delicious American fare and Coney Island is for Detroit’s legendary Coney Dogs. 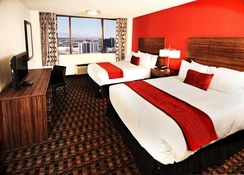 The D Las Vegas is just 1.2km from the Neon Museum displaying vintage Neon signs that lit up this spectacular city. The Mob Museum is just 400m, while the thrilling Fremont Street Zipline is barely 200m away. T-Mobile Arena can be reached in a 20 minutes’ drive. The McCarren International Airport is 14.5km from the hotel. 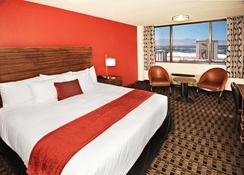 The D Las Vegas offers 629 guestrooms and suites where you can retreat into a private sanctuary of relaxation and rest. Spread over 34 floors, the rooms offer stunning views of the Ferment street and the surrounding area. 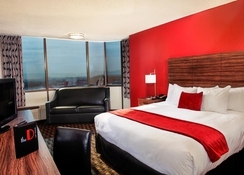 From deluxe rooms to two bedroom suites and the D-suite, there is a room to suite every requirement. Furnished with contemporary furnishings and modern décor, these include a safe, iron & board, desktop USB port, high speed internet and hairdryer. 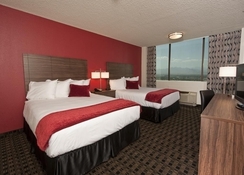 Suites add a separate bedroom with king-sized bed and other plush amenities with exquisite mountain views. The hotel offers three restaurants offering delicious American snacks and meals. The American Coney Island offers an a la carte menu and Detroit’s legendary Coney Dogs. The Joe Vicari's Andiamo Italian Steakhouse is for Italian cuisine during dinner while D-Grill offer all-American fare for breakfast, lunch and dinner. There is also an on-site LONGBAR where guests can enjoy refreshing cocktails. 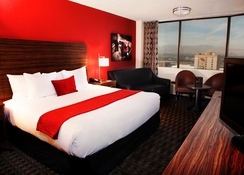 The hotel’s two floor sleek casino is the venue for high-octane gambling with pretty dancing dealers, and Vintage Vegas experience with a Sigma Derby simulated horse race, coin-operated slots and other exciting games. There is a fitness centre where guests can work out to stay active. The hotel has an outdoor pool with shallow end for kids where guests can have a fun-tastic time. There is evening entertainment at the premises and the hotel provides a helpful ticket service to shows in the neighbourhood. Golf and pub crawls (extra charges) are activities are possible in the vicinity.